The best small newspaper in Kentucky last year was again the Todd County Standard of Elkton, according to the results of the 2009 Excellence in Kentucky Newspapers Contest of the Kentucky Press Association. The winner of the medium-circulation class for weeklies was The Springfield Sun, and the best large weekly was The Oldham Era of LaGrange. The top multi-weekly was the Sentinel-News of Shelbyville, and the best small daily was Hopkinsville's Kentucky New Era. It and the Standard, published in an adjoining county, are independently owned; the other three are part of Landmark Community Newspapers, based in Shelbyville. None of these were surprises. The Standard, edited and published by Ryan Craig, right, has a circulation of about 2,500 but has stories, editorials, pages and sections that look like those in a daily with circulation 10 times as large, or more. And it won the categories that we watch most closely: enterprise/analysis story (third place too), investigative story and editorial page, and second and third in ongoing/extended coverage. 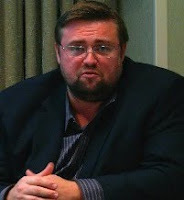 (Craig is shown speaking at the 2009 Society of Professional Journalists convention.) The Trimble Banner, a Landmark paper in the tiny town of Bedford, won second place in the small-weekly class, and the Adair County Community Voice, a relatively new paper started by Sharon Burton, was third. Runner-up to the Sun, edited by Jeff Moreland, was another Landmark paper, the Spencer Magnet. Third in the medium-circulation weekly class was the McCreary County Voice, a locally owned paper competing against a more established, chain-owned weekly. In the large-weekly class, the runner-up was the Jessamine Journal of Nicholasville, a Schurz Communications paper, followed by The Lebanon Enterprise, a Landmark stalwart. 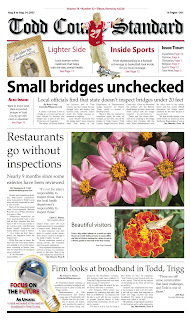 Landmark's Kentucky Standard, of Bardstown, was runner-up in the class for non-dailies published more than once a week. It was followed by The Sentinel-Echo of London, which for two years in a row has been judged the best weekly of Community Newspaper Holdings Inc. These papers regularly wrestle for the title of Kentucky's best weekly. In the small-daily class, the New Era was followed by The Richmond Register, a CNHI paper, and The Messenger of Madisonville, published by Paxton Media LLC of Paducah. The winner among medium-circulation dailies was the Bowling Green Daily News, the state's only other independently owned daily. It was followed by The Gleaner of Henderson, a Scripps-Howard paper, and The Advocate-Messenger of Danville, Schurz's Kentucky flagship. Paxton's hometown paper, The Paducah Sun, placed second in the large-circulation class, which was won by the much larger Lexington Herald-Leader, a metropolitan paper and the state's second largest. The biggest paper, The Courier-Journal, is a KPA member but doesn't enter the contest. One of the most rural states will continue to have ideologically competitive newspapers based in its central, capital city, under a settlement among the Department of Justice and owners of the two papers based in Charleston, W.Va. Under the deal, which settles an antitrust lawsuit DOJ filed in 2007, recently bankrupt MediaNews Group will regain significant control of the editorially conservative Charleston Daily Mail and the paper will offer subscription discounts of at least 50 percent for the first six months to build its revenue base and compete with the independently owned and editorially liberal Charleston Gazette. The papers have had a joint operating agreement since 1958. In 2004, the Gazette's owners bought the controlling interest in the JOA from MediaNews and started paying it a fee to manage its editorial operations. The suit alleged that the Gazette intended to close the Mail, which both papers denied. The papers have competing staffs and publish a combined edition on Saturdays and Sundays. Circulation is about 73,000 on Sunday and 60,000 on Saturday; the Gazette's daily circulation is 46,000; the Daily Mail's is about 21,000, according to the Editor & Publisher International Yearbook. "The proposed settlement requires the two companies to restructure the JOA again by giving MediaNews Group independent control over the operations of the Daily Mail as well as economic incentives," Editor & Publisher reports. The Gazette reported the deal in a relatively short story without a byline. Daily Mail Business Editor George Hohmann offers more details and writes that the deal "aims to keep both newspapers publishing with separate newsrooms and editorial opinions for years to come." UPDATE, Jan. 25: Alan Mutter writes on his Reflections of a Newsosaur blog about how the MediaNews bankruptcy may affect the JOAs in which the company is involved. We've been paying close attention to reports about hydraulic and chemical fracturing for natural gas for about two and a half months; now The Wall Street Journal offers a situation piece saying that increasing environmental concerns about the drilling method "is threatening to slow development of the huge gas fields that some hope will reduce U.S. dependence on foreign oil and polluting coal." Ben Casselman and Russell Gold write that fracking "has turned gas deposits in shale formations into an energy bonanza" but has also "triggered increasing debate over whether the drilling process could pollute freshwater supplies. Federal and state authorities are considering action that could regulate hydraulic fracturing, potentially making drilling less profitable and giving companies less reason to tap into this ample supply of natural gas." That's an investor-oriented angle on old news for us, but the story has a good diagram, reproduced here, and the writers reveal that Exxon Mobil Corp. negotiated the right to back out of its acquisition of gas producer XTO Energy Inc., "a fracturing pioneer, in a deal now valued at $29 billion ... if Congress passes a law to make hydraulic fracturing illegal or 'commercially impracticable'," whatever that means. Maybe what courts say. The story also offers some useful fundamentals: "The chemicals make up less than 1 percent of the overall solution, but some are hazardous in low concentrations. Today, the industry estimates that 90 percent of all new gas wells are fractured. . . . As the industry has honed its techniques, hydraulic-fracturing operations have become more complex, requiring far more water and chemicals — millions of gallons per well, rather than tens or hundreds of thousands of gallons in the past." 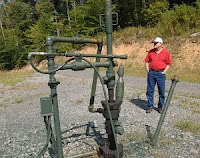 And just as that trend was developing, in 2005, Congress exempted fracking from the Safe Drinking Water Act of 1974. Now bills are pending to repeal that exemption, and "several states, including Colorado, Pennsylvania and New York, have either passed or are considering tightening regulations on fracturing and related activities," the Journal notes. "Most people agree that means that if a fracturing job is done correctly, it would be virtually impossible for water or chemicals to seep upward into drinking water supplies," Casselman and Gold write. "Environmental groups point out that wells aren't always constructed properly. Moreover, they say, storage ponds that hold chemical-laced water after fracturing is complete can overflow, and trucks carrying chemicals can crash." And the reporters note the death of some Louisiana cattle from a spill of drilling fluids. The 1,837-word story is the most comprehensive we have seen on the subject in mainstream media. It's worth reading. TV and radio stations can expect more political advertising this year because of this week's U.S. Supreme Court ruling allowing corporations (and, by extension, labor unions and other interest groups) to directly advocate the election or defeat of political candidates with ads, Wayne Friedman reports for MediaDailyNews. We hope that the stations will couple this windfall with more responsibility. Unlike ads from candidates, they are not required to run such ads if they find them unacceptable for being false, misleading or otherwise short of whatever standards the stations choose to impose. Some stations have rejected such ads because the buyers were not able to substantiate their claims. A shortage of mental-health professionals in rural areas is a nationwide problem, but an attempt to help rural Minnesotans to have better access to those services is about to start producing results. When the state legislature attempted to create a new master's-level designation for Licensed Professional Clinical Counselor in 2007 it failed to officially name holders of the license "mental health professionals," which meant they had to be supervised by another professional during counseling sessions, Tom Robertson of Minnesota Public Radio reports. Lawmakers fixed the oversight last spring, and this fall those LPCC designations will carry the power to work independently. "Minnesota is one of the last states in the country to allow master's level degree holders to counsel clients independently," Robertson writes. Bemidji State University reports applications for its masters level program are up due to the new legislation. The number of foreign-language courses offered in middle and high schools across the country has been steadily declining over the last decade, but a new survey shows a rush by schools in all parts of America to offer instruction in Chinese. Some of the schools are paying for the courses on their own, Sam Dillon of The New York Times reports, but others are taking advantage of a program funded by the Chinese government that sends teachers to the U.S. and pays part of their salary. The trend isn't limited to coastal metropolitan areas. The survey shows "many schools have started Chinese programs in heartland states, including Ohio and Illinois in the Midwest, Texas and Georgia in the South, and Colorado and Utah in the Rocky Mountain West," Dillon writes. "The mushrooming of interest we’re seeing now is not in the heritage communities, but in places that don’t have significant Chinese populations," Chris Livaccari, an associate director at the Asia Society, told Dillon. Little in the way of breaking news was offered during the debate, and the participants found little to agree on. "The mission statement for coal is prosperity for this country," Blankenship told the capacity crowd. "This industry is what made this country great and if we forget that, we're going to have to learn to speak Chinese." Kennedy disagreed, saying of mountaintop-removal coal mining: "This is the worst environmental crime that has ever happened in our history. These companies are liquidating this state for cash with these gigantic machines." You can see further examination of the debate on Ward's blog "Coal Tattoo." Erica Peterson of West Virginia Public Broadcasting also has a story about the debate along with full audio of the proceedings. Alaska Republican Sen. Lisa Murkowski introduced a resolution Thursday that would prevent the Environmental Protection Agency from taking any action to regulate carbon dioxide and other climate-altering gases. The proposal would use the Congressional Review Act to strip EPA's power to regulate greenhouse gases awarded by a 2007 Supreme Court ruling, John M. Broder of The New York Times reports. "Her resolution requires a majority vote in the Senate, a remote possibility because of the strong opposition of the Democratic leader, Senator Harry Reid of Nevada, and most other Democrats," Broder writes. "It faces even longer odds in the House. And then it would require the signature of President Obama, who is all but certain to veto it because it would rob him of a critical regulatory tool." Murkowski has near unanimous support from Republicans as well as Democrats Blanche Lincoln of Arkansas, Mary Landrieu of Louisiana and Ben Nelson of Nebraska. But it may reveal increased resistance to passing a climate-change bill. As an alternative to the House-passed climate bill, "Republicans and Democrats alike expressed interest in a 'Plan B' approach from Sens. Maria Cantwell (D-Wash.) and Susan Collins (R-Maine) for capping emissions," reports ClimateWire (subscription-only). "The plan would return the majority of the revenue raised from a climate program to consumers through a dividend." A new report from a West Virginia environmental consulting group says competition from other coal producing areas and a depletion of reserves is fueling a steep decline in Central Appalachian coal production. The report from Downstream Strategies, a group that works to link economic development with environmental protection, warns this trend is almost certain to continue, Ken Ward Jr. of The Charleston Gazette reports. "Given the numerous challenges working against any substantial recovery of the region's coal industry, and that production is projected to decline significantly in the coming decades, diversification of Central Appalachian economies is now more critical than ever," the report said. "State and local leaders should support new economic development across the region, especially in rural areas set to be the most impacted by a sharp decline in the region's coal economy." Cheap natural gas prices and expected growth from renewable energy are also cited as factors in Central Appalachia's coal decline. The report does not include possible limits to greenhouse gas emissions or mountaintop removal in its conclusion, Ward reports. Authors Rory McIlmoil and Evan Hansen call for "a greater focus, among other things, on encouraging renewable energy, reforestation and reclamation of previously mined lands, and local ownership of future alternative energy developments," Ward writes. You can read the Gazette's print story or Ward's extensive breakdown of the report on his Coal Tattoo blog. Meanwhile, the Appalachian Transition Initiative, a new partnership between the Mountain Association for Community Economic Development and Kentuckians For The Commonwealth, has launched a Web site "to promote an active, action-oriented, public conversation about the necessary transition to a new economy in Central Appalachia," MACED President Justin Maxson reports. The site is http://www.appalachiantransition.net/. A program favoring increased emphasis on regional alliances in rural America is likely to be announced soon, says the under secretary of rural development at the U.S. Department of Agriculture. Dallas Tonsager hinted at the announcement while speaking to chairs of agriculture committees from 47 state legislatures meeting at the Legislative Agricultural Chairs Summit last weekend, Bill Bishop of The Daily Yonder reports. "We’ll becoming out soon with a proposal on regionalism," Tonsager told the legislators. "I would urge you to look at what Iowa did when [USDA Secretary Tom Vilsack] did when he was governor [of Iowa]." While in Iowa, "Vilsack went so far as to propose reducing the number of counties from 99 to about 15, following the lines of community college districts," Bishop writes. Beekeeping associations across the country are using the remaining months of winter to offer introductory and advanced courses for prospective and current apiarists. In our home state the University of Kentucky Cooperative Extension offices, the Kentucky Apiarist's office and local beekeeping clubs are offering beekeeping schools now through March across the state. Bees are essential to pollination of many crops, and there is concern about them because of colony collapse disorder, which kills off hives. A quick news search also reveals stories about upcoming beekeeping schools from the Sanford News in Maine, the Wisconsin Agriculturist, The Patriot Ledger in Massachusetts, and the Sussex Countian in Delaware. The first round of stimulus grants for rural broadband development were awarded in December, but organizations hoping to apply for the second round of funding have several opportunities to learn more about the grant process. The $ 4.8 billion available in the second round of funding will come from the National Telecommunications and Infrastructure Administration and the U.S. Department of Agriculture's Rural Utilities Service. The National Rural Assembly has passed along a list of 10 NTIA and RUS workshops aimed to review the application process and answer questions from prospective applicants. You can see the list below and or read the NRA release. A new study released by the U.S. Department of Energy says a reorganization of the power grid and a significant increase in costs could lead wind power to replace the coal and natural gas burnd to generate 30 percent of the electricity used in the eastern two-thirds of the country. Even after that large investment, the increased wind power would only modestly reduce carbon dioxide emissions linked to global warming, Matthew L. Wald of The New York Times reports. The chief takeaway from the report, Wald writes, is "wind energy is 'technically feasible' but will require significant expansion of the power grid." David Corbus, a senior engineer at the National Renewable Energy Laboratory, which supervised the study, told Wald that investment would equal about $93 billion in today’s dollars, but that sum, was "really, really small compared to other major costs" in the power system. The study did not address overcoming current political barriers to building more power lines for increased transmission or finding sights for supplying 10 times the current level of generating capacity. We had an item the other day on predictions for the biggest small-town business trends of 2010. One of them, "shop local" campaigns, struck us as a bit stale. In today's Wall Street Journal, Diana Ransom reports, "Recent research shows that buying local campaigns provide only limited and short-lived results for small businesses." So what are small-business owners supposed to do? Focus on the fundamentals, such as customer service and product quality; broaden the definition of "local" to include imports sold locally; and offer distinctive or even unique products and services that make customers "view your shop as unique and deserving the premium that small businesses often need to levy," Ransom writes. Good advice, it seems, but we must point out that Ransom and her editors need a lesson in the meaning of the word "unique," which has become one of the most overused and misused words in American English. She writes, "offer unique or even one-of-a-kind products and services." That's the same thing! A new report from the Environmental Working Group says poor federal oversight of hydraulic fracturing, a drilling technique that boosts natural gas extraction by blasting water, sand and chemicals underground at high pressure, puts drinking water supplies at risk. EWG, a Washington-based research and advocacy group, says drilling companies are "side-stepping a permitting requirement for the use of diesel fuel in their fracturing fluids by using similar petroleum distillates that contain the same toxins as diesel, but require no permitting," John Collins Rudolf of The New York Times reports. We most recently reported about the ongoing debate over new Environmental Protection Agency regulations governing the disposal of coal ash last week. One of the country's top newspapers has chimed in. "The agency’s recommendations, which have not been made public, are now the focus of a huge dispute inside the Obama administration, with industry lobbying hard for changes that would essentially preserve the status quo," The New York Times writes in an editorial. "The dispute should be resolved in favor of the environment and public safety." The Times dismisses arguments that a hazardous-waste designation for coal ash would damage beneficial recycling efforts. "Evidence suggests that tough but carefully tailored rules could encourage even more recycling, protecting the environment while yielding income to help pay for more secure landfills," the editorial says. New analysis from the Environmental Protection Agency shows four of every 10 U.S. lakes are in fair or poor condition. The report is the first from EPA using consistent criteria to evaluate lakes; it reveals that man-made impoundments tend to be in worse condition than natural lakes. The findings were "based on a review of indicators for physical, chemical, and biological measures of water quality; condition of lakeshore and shallow water habitat; and ability to support selected recreational uses," the Society of Environmental Journalists reports. The investigation analyzed more than 1,000 lakes in the lower 48 states that were selected to represent the over 50,000 lakes in the contiguous U.S. Individual findings for specific lakes were not released, but the EPA report groups lakes into nine eco-regions. "Ninety-one percent of the lakes in the Upper Midwest were in good biological condition, compared to just five percent in the Northern Plains," SEJ reports. "Recreational conditions were by far the best in the Western Mountains and the Northern Appalachians, and the worst in the Northern Plains and Temperate Plains." Yesterday, the Kansas State Supreme Court granted a Dodge City Globe reporter's request to temporarily stay an order requiring her to reveal a confidential source to Ford County prosecutors. Clair O'Brien was scheduled to appear today before an inquisition at which prosecutors would force her to source's identity and content of unpublished notes regarding her interview with Samuel Bonilla, who is charged with second-degree murder in a Labor Day shooting death, The Associated Press reports. "The newspaper has challenged the subpoena on the grounds that forcing O'Brien to testify would violate her First Amendment rights and hurt her ability to gather news," AP reports. O'Brien maintains she has already told Ford County Attorney Terry Malone what Bonilla told her during the jailhouse interview, when she called the prosecutor for comment. Malone also wants O'Brien to reveal confidential sources who said "one of the victims had 'a base of support that is well-known for its anti-Hispanic beliefs' and has a supply of semiautomatic weapons," AP reports. The 3,000-member Jemez Pueblo tribe in northern New Mexico is on the verge of building the nation's first utility-scale solar energy plant on tribal land. The project, which could bring millions of dollars to the tribe, is moving ahead with the site selected and the contract to sell outsiders the four megawatts of electricity at hand, Susan Montoya Bryan of The Associated Press reports. "Experts say tapping into the sun, wind and geothermal energy on Indian land could generate the kind of wealth many tribes have seen from slot machines and blackjack tables," Bryan writes. "We don't have any revenue coming in except for a little convenience store," James Roger Madalena, a former tribal governor who now represents the pueblo in the state Legislature, told Bryan. "It's very critical that we become innovative, creative, that we come up with something that will last generations without having a devastating impact on the environment." Republican Scott Brown won the Massachusetts U.S. Senate special election Tuesday and dealt a serious blow to the Democratic health-care reform bill, but he didn't win on the strength of the rural vote. Democrat Martha Coakley, the state's attorney general, won the counties with both the most rural and urban populations, while Brown rode victories in the more suburban counties to victory, the Daily Yonder reports. Despite using victories in rural states like Iowa to win the 2008 election, President Obama hasn't met with a single pundit from middle America, libertarian columnist Steve Chapman of the Chicago Tribune reports. Chapman asked the White House for a list of commentators who met with the president in the last year and was provided a list of 37 names, none of which "hails from outside the Georgetown-Manhattan corridor." "There are, of course, dozens of columnists and editorial writers from flyover country, but the White House hasn't found one worthy of a meeting with Obama," Chapman writes. "There are also lots of conservatives and libertarians, but they also need not apply." Self-described conservative columnists Kathleen Parker and David Brooks did meet with Obama, but Chapman writes neither "is a favorite of most true-blue right-wingers." Parker, left, is the closest thing to a middle American writer; she's based in both Camden, S.C., and Washington. Mountaintop-removal mining, and the scientist who led the recent study of it, made it to "The Colbert Report" on Comedy Central yesterday, giving the issue a higher national profile. Stephen Colbert's three-minute repartee with Margaret Palmer of the University of Maryland revealed only a few basics of the issue, such as stream damage, but the comedian suggested an underlying factor that may have limited attention and action on the issue: its location. In November we reported about the ongoing threat invasive Asian carp are posing to the Great Lakes. Now a group of Louisiana companies is hoping to turn the nuisance into a marketable meal, The Associated Press reports. The Louisiana Department of Wildlife and Fisheries marketing plan calls for the carp to be branded "silverfin," and the agency recently approved preliminary rules for the harvesting of the fish. Several restaurants and food companies have already developed recipes like silverfin cakes and silverfin almondine. Rivere Foods of Paincortville will be the lead processor, New Orleans Fish House will be distributing the frozen products, and Rouse's Supermarket is the first official buyer, AP reports. Chef Philippe Parola, CEO of Chef Parola Enterprises and Partran, describes the silverfin taste as a cross between scallops and crab meat. "This is being done without any taxpayer dollars," Parola told AP. "This is our money." Michael Simmons, right, managing editor of The Cleveland Current in northwest Mississippi, has challenged local officials and community members to a health and wellness competition for 2010. To help promote the BlueCross BlueShield Healthy Initiative run by Delta State University, Simmons encouraged the Cleveland mayor, aldermen, the Cleveland School Board and the DSU senior cabinet to undergo baseline health screenings. At the end of the year, the participants will be measured for improvements. If Simmons beats "Team Cleveland" he gets an official declaration for Michael Simmons Day from the city in his honor. A certain age group of local students, determined by which group has the most students sign up for the health initiative, would be invited to a party on the DSU campus to celebrate the occasion. "So, all entities I have called out have a good reason to stop me," Simmons wrote in his column announcing the challenge. "I’m sure the city board doesn’t really want to have a day in my honor. I’m sure the school district doesn’t want to have to let children escape for a day to play." American farmers are under assault from "urban aesthetes and green activists who hope to impose their own Utopian vision of agriculture," writes Forbes.com columnist Joel Kotkin. He says this vision includes shutting down "large-scale, scientifically run" farms and replacing them with "small organic homesteads and urban gardens" despite the ever increasing world population and its need for food. As "the assault" moves into the policy arena, water cut-offs, stricter rules on pesticides, prohibitions on the caging of chickens and a growing movement to ban the use of genetic engineering in crops account for the most troubling facets of the green movement, Kotkin writes. Despite the vision of agriculture as an industry of small family farms being promoted by authors like Michael Pollan, Kotkin says American agriculture, dating back to the early 19th century, has always been big business. The Tennessee Valley Authority's new spokesman was brought in to help the organization regain credibility after the Kingston, Tenn., coal-ash disaster in 2008, but questions about his performance at his previous job with NASA have followed David Mould to Tennessee. A 2008 report from NASA's inspector general includes several mentions of Mould in reaching its conclusion that the agency's public-affairs ofice "managed the topic of climate change in a manner that reduced, marginalized, or mischaracterized climate-change science," Anne Paine of The Tennessean reports. Mould says the NASA conflict began before he arrived in 2005 and was caused by tension between scientists, "who couldn't tolerate announcements they wrote on their findings being edited for clarity, and public relations officers, who could be lousy editors," Paine writes, quoting Mould: "When I got to NASA, I found a lot of cases where the science people and the communications people were at each other's throats over some kind of editing mistake or another. Quite often they were fast to label anything they disagreed with as some kind of political thing, which it was not. I'm not saying there was never any whatsoever." A list of last year's best investigative journalism, compiled by California Watch Editorial Director Mark Katches with the suggestions of top editors and reporters around the nation, includes December stories by Daniel Gilbert of the Bristol Herald-Courier, circulation 33,000, about the mess Virginia and its natural-gas companies have made of a law and program to develop the state's coalbed methane and pay royalties to those who have a claim on it. (Herald-Courier photo by David Crigger) To read the main story that began the eight-day package, click here. For the second day, here. Other stories reported how coal companies block access to royalties, how the state escrow fund is bleeding money, how gas companies fail to pay into the fund, how small landowners are left without royalties. As the series concluded, the state Oil and Gas Board voted to audit the fund. J. Todd Foster, editor of the Media General paper, wrote in a column that the problem "involves millions of dollars and affects thousands of Southwest Virginia property owners," many of them scattered across the country, and various "forms of malfeasance, corruption and outrage." He said the gas companies "are getting rich. The moms and pops who own the land are getting screwed" and "can’t afford to battle deep-pocketed corporate armies of attorneys bent on stringing the process out over years." He detailed how the story developed, and how Gilbert reported it over 13 months. "This is a classic example of how a newspaper dedicated to a community can mine a story that no one else would have ever tackled for its sheer complexity and obscurity." Foster, who has a pugnacious streak we like, couldn't resist ending his column with this paragraph: "The rest of you also need to ponder this fact: If newspapers fall by the wayside as victims of a fragmented media landscape, much of it free and offered on the Internet by authors untrained in journalism or its ethics, then you can kiss goodbye watchdog reporting that keeps government and the private sector from straying outside the lines of the law." Amen! A venture-capital firm in rural southeastern Kentucky has broken ground for an "eco-friendly business incubator," reports Carl Keith Greene of The Times Tribune in Corbin. Kentucky Highlands Investment Corp. will use the "9,000 square feet for product development, office space and laboratory facilities for local entrepreneurs," and estimates that in the next five years will "assist 16 businesses, create 127 new jobs and generate $6 million in private investments," Greene writes. The company's curent incubator has a capacity of three businesses, and has spawned four businesses that employ more than 30 people. Highlands spokeswoman Carla Blanton said a typical business requires three years in an incubator with an option for a fourth.